Libraries are outspoken advocates for information accessibility and accommodations. As a society we want every person to be able to have the same rights and privileges, which is why the Accessibility for Ontarians with Disabilities Act (AODA) became law on June 13th 2005. The goal by 2025 is to ensure that Ontario is fully accessible for all those who have disabilities. Disability comes in a variety of forms, be it learning, physical, permanent, temporary, etc. 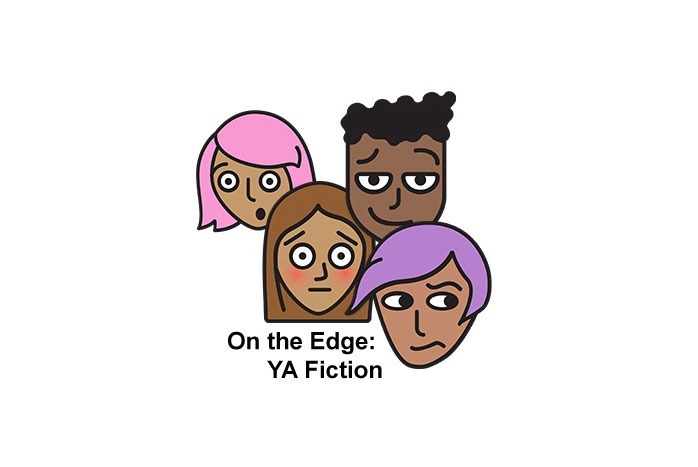 Libraries have always played a key role in accessibility, but what about in terms of sharing fictional resources that focus on disability for middle graders and teens? 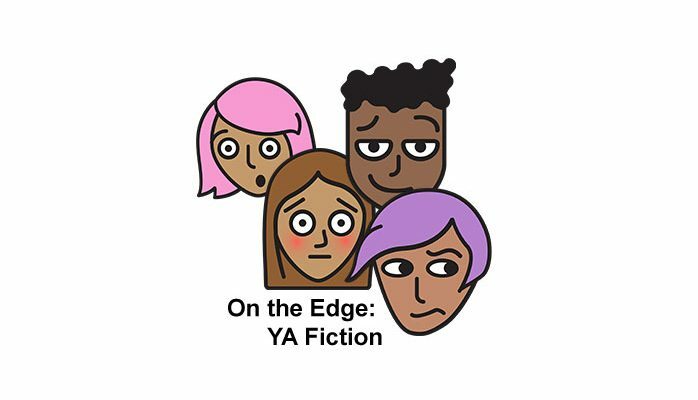 While middle grade fiction has been a fantastic platform for topics related to disability, young adult fiction unfortunately suffers from a lack of representation. There’s no obvious reason why this is the case, but this is one group whose voices tend to underrepresented. As a result this month I decided to share with you all a few young adult books that focus on disability and inclusivity. 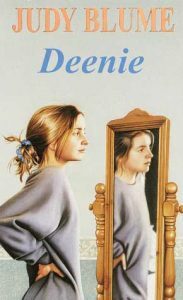 First off we have the classic novel Deenie by Judy Blume. Originally published in 1973, it was one of the first young adult novels that really focused on how disability can transform someone’s life. Deenie is diagnosed with scoliosis and is forced to wear a neck brace. She’s embarrassed and frustrated, all because her mother wanted her to become a cheerleader. Deenie throughout the story struggles to accept her diagnosis and is forced to confront it head on when she is told that if she doesn’t wear her neck brace it could cause permanent damage to her spine. Deenie is conflicted and scared about how her classmates will respond to her being in a neck brace. She is convinced she will be made fun of and tormented. She is given permission to ride “the special bus” home from school, which immediately sends her into a tizzy. This novel not only does an excellent job of teaching readers about scoliosis, it also clearly portrays a young teen’s reaction to a disability. In Deenie’s case it’s temporary; not everyone is that lucky. 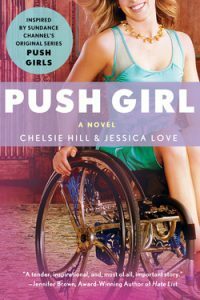 Enter Push Girl by Chelsie Hill and Jessica Love and we move into a much more difficult situation. Kara, our heroine, has a lot to deal with at home with her parents divorce. One day she goes to a party, sees her boyfriend cheating on her, storms out in emotional distress only to be hit by a car resulting in the loss of her legs. Now confined to a wheelchair, Kara is forced to accept that she will never be like everyone else ever again. However, unlike Deenie, Kara attempts to embrace her newfound disability and becomes an advocate for others. This novel shows that goals can be achieved regardless of ability. She is a role model for those who feel they can’t achieve their dreams. The character Belinda, who has a developmental disability, is bullied at a football game. Emily and Lucas witness the act and do nothing to help her. Because of their inaction, they are required to work with the disabled, learning about relationships and social skills. They find out in the process that Belinda had in fact defended herself from her attackers and escaped. What is interesting about this book is the dual perspective of someone who is able and someone who is disabled. The novel teaches readers how much you can learn from those who are different from you and that disability isn’t something to be ashamed of. 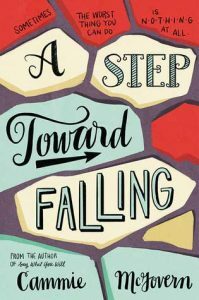 Cammie McGovern has an amazing ability to write about disability with clarity and sensitivity, making her a must read for those who wish to explore young adult literature that focuses on disability. All three of these novels do an excellent job of sharing disability in a way that doesn’t feel insensitive. However, we need more inclusive young adult literature that focuses on disability as a way to enable teens to learn what disability really is and how people overcome it. These three novels are great starting points for any young adult looking for sensitive and realistic portrayals about disability. They are also recommended reads for anyone curious about exploring the topic further. Teens are a challenging group, but they live in a difficult and always changing world where social issues are constantly fluffed under the rug.